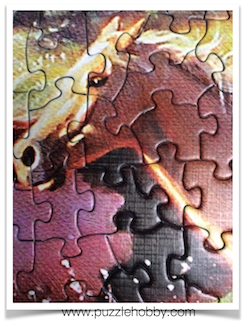 I am like a magnet when it comes to horses and jigsaw puzzles! 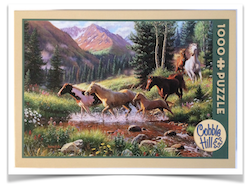 We had a couple of horses in our back yard as children and I spent a lot of time with them. For those others who have spent time with horses will know the special bond and relationship horses share with humans – and they are a lot of work but the rewards of riding a horse in the fields is well worth it! Yet there is something associated with the word ‘freedom’ when you see a group of horse running wild and free in those meadows – an elegance perhaps. 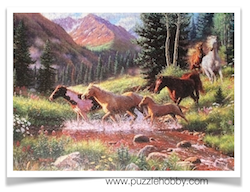 Like many Artists, Mark Keathley has captured that image of ‘free-elegance’ in the image painted for this jigsaw puzzle. 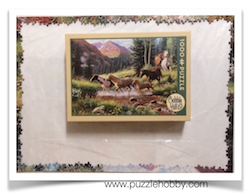 The Mountain Thunder is 1000 piece Cobble Hill Puzzle Company jigsaw puzzle I recently received to review. 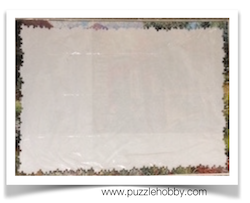 The size is 48.9 x 67.6cm or 19.25 x 26.625″ and it is in random cuts. I saved the best for last. How exciting!!! Just recently experiencing the painted brush strokes on the Black Bear Brook which proved to be tricky, I sensed a similar situation was going to happen here. So I proceeded with my usual sorting routine which was basically sorting by rainbow colors as you can see in the piles and then laid out on the foam boards. You will notice a sorta grid-screen appearance over every piece which is more visible on the light colors. 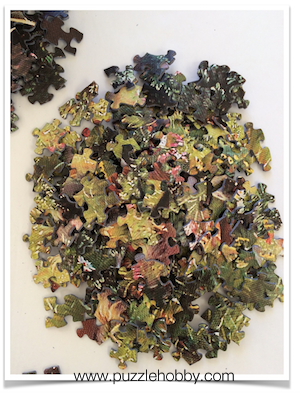 I sent an email to my contact at Cobble Hill Puzzle Company and she provided me with the following information……. Fair enough response I received and yes we will be interested to see why this happens to the image. 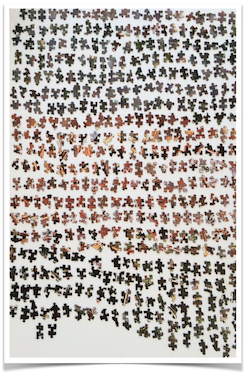 In the meantime, since I was the one who chose to assemble this puzzle I figured I best put it to the test. AND it would make for another interesting review. 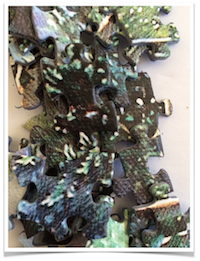 But before I go further, I can show you some of the close up photos of the way the pieces look when they are put together. You can see the grainy-fuzzy appearance once again in the lighter shaded areas. 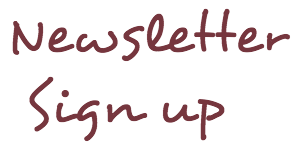 Click on the photos to see the larger image. I started the border which was not too daunting – most rarely are. 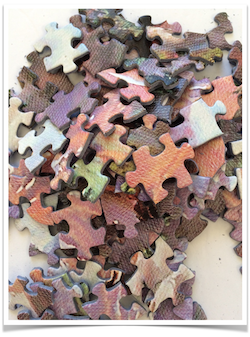 Then I thought – now what-where to begin. 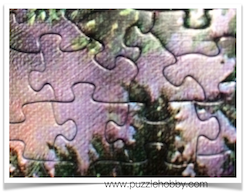 I decided to go with the mountains, trying to place the purple grains with the pinkish and light greens. 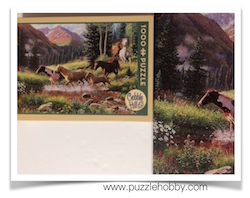 From there I built up some of what is the ‘horses running through the water’ because the pieces were like a spotted red/brown color. The rest of the image I really wrestled with. I could not identify most of the horses and the white horse was completed only by eliminating the other soft rainbow colors. 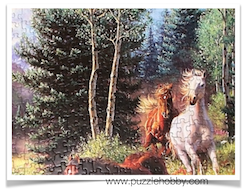 The dark green trees and dark areas around the horses were quite challenging. 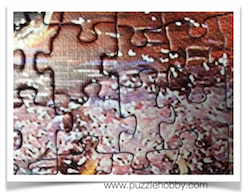 It was the shapes of the puzzle pieces that pulled me through this one. I was soooo consumed with this one that I did not even take progress photos. 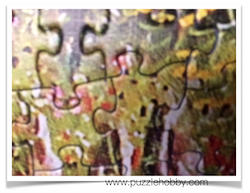 It required my complete attention so the focus level was totally therapeutic for me. Good thing! However, there was a lot of….’ooohhhh there’s a horse now’ and ‘so these are the rocks’. I was determined to complete this one simply because I had chosen it but it was one of my longer session times. It took over 18 hours to assemble this one. 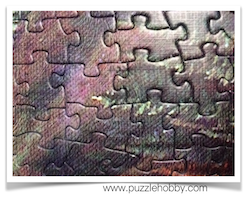 And look how beautiful it looks now…..It is best to stand back away from the puzzle to enjoy the view because you can see the grainy-fuzzy look if you are close up to it. I have placed the box cover beside the image so you can see the difference in the images. The box image does look quite clear in this photo perhaps because it is on digital screening. 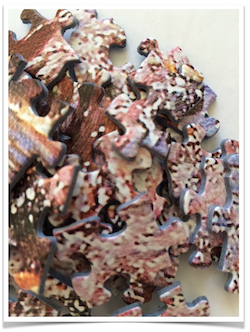 So now I have ‘schooled’ on certain puzzles that are done by artists – nothing against the Artist of course or even Cobble Hill Puzzle Company for that matter. 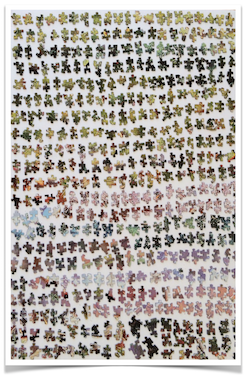 They have a terrific selection of puzzles. I will be cautious going forward to selecting these types of images though.